Dr. William Abraham Groves was born in Fergus, Ontario on the 21st of March, 1877. His parents were Dr. Abraham Groves and the former Jane “Jeannie” Gibbon. His father had been born in Ireland and he was a family physician in Elora, Ontario. Dr. William Groves had one sister, Laura Kathleen, who was born on the 7th of June, 1879. He was educated in the Fergus area before going to The University of Toronto. Dr. Groves graduated B.A. in 1899. While studying for his B.A., Dr. Groves played hockey, lacrosse and football. He was also a member of the Literary Club and served as the Historical Secretary. Dr. Groves continued his studies and graduated M.B. from The University of Toronto Faculty of Medicine in 1903. According to the 1928 Ontario Medical Registry, Dr. Groves joined the Ontario College of Physicians and Surgeons on the 14th of December, 1903. Dr. Groves was the house surgeon at the Royal Alexandria Hospital in Fergus. His father established the hospital in 1902. In 1904 Dr. Groves did post graduate work in London, England. Dr. Groves started practicing medicine in Fergus in 1905. Dr. Groves married Maria Rathburn ‘Burnie’ Sutherland on the 21st of January, 1907 in Hanover, Ontario. Her parents were the Rev. William Sutherland and the former Marion Ross. Mrs. Groves was from a blended family of 18 children. She was born on December 23rd, 1878 in Glencoe, Ontario. On the marriage record, it states that Mrs. Groves was a nurse. Dr. and Mrs. Groves had a daughter, Helen Sutherland Groves born to them in Fergus on the 24th of April, 1909. In March of the following year, they had twin sons born prematurely on the 1st of March. Sadly Mrs. Groves died on the 3rd of March and one of the twins died on the 4th of March (1910). The surviving twin was named William Rathburn “Sutherland” Groves. He went on to become a doctor. Dr. Groves moved to Ridgetown shortly after his tragic loss. He married Irene Ethel Locke on the 12th of December, 1911 in Ridgetown. She was born on the 22nd of December 1886, the daughter of John Charles Locke and the former Jean Leitche. Mrs. Groves had an older brother named Charles and two younger sisters, Jeanet and Greta. Her father owned a furniture store in Ridgetown. Dr. and Mrs. Groves moved to Saskatoon, Saskatchewan sometime around 1913. They had a daughter Irene, born in June of 1914 in Saskatoon. When the baby girl was a week old her mother, Irene Groves died on the 20th of June, 1914. Mrs. Groves was buried at Greenwood Cemetery in Ridgetown. Despite being widowed and having 3 young children, Dr. Groves enlisted on the 29th of July 1915 as a Major with the Canadian Army Medical Corp. At the time he was living in Saskatoon, Saskatchewan. Dr. Groves had past experience serving with the Militia. He was attached to the 65th Overseas Battalion. His young daughter Irene, went to live with his wife’s parents, John and Jean Locke in Ridgetown. According to the 1921 census she was still living with them in 1921. 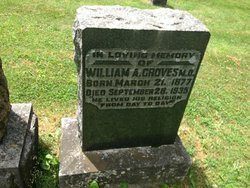 Dr. Groves died on the 28th of September, 1935 in Fergus. 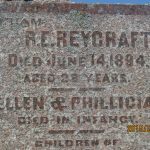 He was buried at the Belsyde Cemetery beside his first wife ‘Burnie’ and the little son that was born and died prematurely. Photo: Courtesy of Wellington County Museum and Archives ph 15404.